Abraham-Louis Breguet (10.01.1747 – 17.09.1823) is considered one of the most influential and innovative watchmakers in history. Among his numerous inventions are: the shock proof escapement, the further development of the tourbillon and many others. He made the most complicated watches ever and worked together with other brilliant watchmakers such as the englishman John Arnold. Apart of making watches for important personalities of his time such as Marie – Antoinette, Napoleon I or Alexandre Dumas, he was also concerned about making a watch which could be afforded by non-wealthy people. By reducing the production costs using less pieces and making the movements less complicated he developed the ‘souscription watch’. Because of the violent political situation in France, Breguet decides 1793 to go to Switzerland, where he stays until May 1795 where he’s called back to Paris by the French government. The time spent in Switzerland was quite prolific for Breguet. While leading his workshop in Paris from a distance, he also integrated the newly politicised rather poor economic status of the average French citizen into his concept of watchmaking. The French revolution somehow opened for Breguet a new market: the poor man’s watch. The idea of such a watch came most probably from Jacques Frédéric Houriet a watchmaker in Le Locle and a close friend of Breguet. Houriet drew such a system already in 1777. Breguet started his work on what will get the ‘souscription ‘ watch as early as 1791, to further develop it, maybe together with Houriet, during his stay in Switzerland while spending his exile in Switzerland. To be affordable by the average citizen, the watch had to be produced using less means. Saving labor time and material was the key to success. The ‘souscription watch’ could be bought on order, with a down payment of one fourth of the total price. The watch is simple and of rather big diameter (40 – 61mm), featuring an enameled dial with arabic numbers and five minute marks. 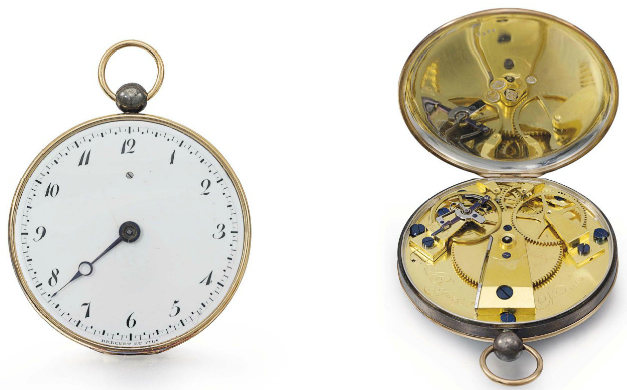 The movement is a caliber unique to the souscription watches, with a very symmetrical disposition of its components. Depending on the budget of the buyer also silver guilloched dials with sometimes roman numbers were used. All souscription watches have the single breguet-style hand in common. The cases were in silver, gold or a combination of the two. The commercialisation began in 1797 with a advertising flyer. It is estimated, that about 700 of these watches have been built. This new watch got the attention of a new clientele and built the basis for Breguet to develop the first ‘tactile’ watches. Breguets impeccable reputation concerning innovation, aesthetics and precision led to many conteporary fakes. To counteract the avalanche of forgeries Breguet developed a randomized numbering system for his watches, where dials, and movements were numbered and this individual number was listed in a very elaborate filing system. Now most of these handwritten notes with the numbers of the watches and all information belonging to it like: buyer, price, complications, material and scetches, belong to the Breguet Museum in Paris. The curator of this collection of manuscripts and a large collection of watches is non other than Emmanuel Breguet, direct descendant and the world leading expert about Abraham-Louis Breguet’s work. These archives are now used by Emmanuel Breguet to preserve, reconstruct and teach the history of Abraham-Louis Breguets genius and to authenticate antique watches.